For years, we used to order Chinese delivery every Wednesday night. Then, about a year ago, I decided I wanted to start making it myself. I'd made various stir-fries over the years, but I wanted to learn how to make a really good version of my favorite Chinese dish: Kung Pao Chicken. Although I didn't set out to intentionally make a healthier version of Kung Pao Chicken, it would be hard not to, given how oily takeout Kung Pao usually is. I wanted a dish that appropriately highlighted the chicken with not too many vegetables mucking that up. The sauce should be that perfect balance of spicy, sweet and savory. For awhile, I was really into this about.com recipe, although over time, I felt like it wasn't "saucy" enough. Also, I bought Szechuan peppercorns as the recipe calls for, but chickened out from ever using them because the package says they needed to washed first for safety reasons. This one looks pretty, but I think it's odd that it has red wine vinegar. And as much as I like ginger, I don't think it belongs in Kung Pao. This one also looks good and is really close to the one I've decided is my favorite. 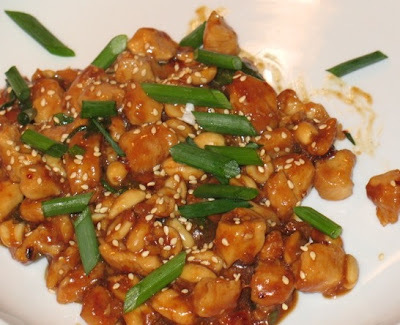 My favorite Kung Pao Chicken recipe that I've made again and again is this one from Food & Wine Magazine. I've modified it a bit to add garlic and ground white peppercorn. Every once in a while I might add some celery or red bell pepper, but as I said earlier, too many vegetables spoils the meat focus of this dish. 1. Combine marinade ingredients with diced chicken and marinate while you perform the next steps until the pan is ready. 2. Combine all of the sauce ingredients and set aside. 3. Heat 2 tbsp oil in a large, deep-sided nonstick skillet over medium-hot heat until hot and shimmering. Add chicken to pan and leave undisturbed for a couple minutes to brown, then stir and cook through. Remove from pan. 4. Add remaining 1 tbsp oil to pan. Add minced garlic, peanuts, diced scallion bulb and red pepper plakes. Saute until garlic is fragrant but not browned. Add chicken back then pour sauce into pan. When sauce starts to bubble, reduce heat to medium and add about half of the chopped green part of the scallions. When sauce is thickened, remove from heat and serve sprinkled with toasted sesame seeds. I used to love getting Chinese take-out on Wednesdays, but now I look forward your Kung Pao chicken (although I think you can never go wrong with red bell pepper).